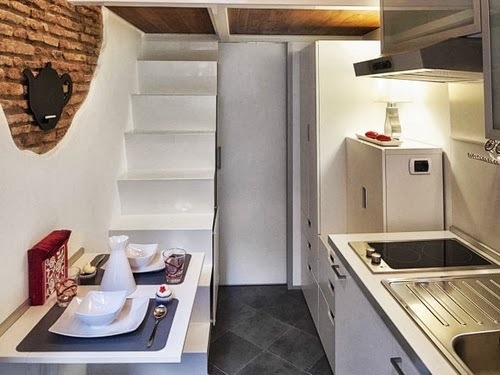 Smallest House in Italy is what Italian Architect Marco Pierazzi calls it. 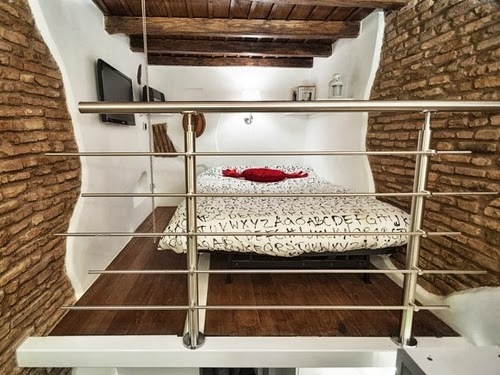 He bought it in 2010 and started renovating so that he could live in it with his wife. 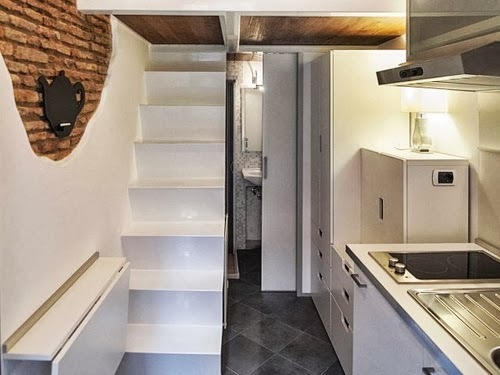 The house is 75 square feet which is about 7 m2, very small but as you are going to see, they managed to fit all they need in it. 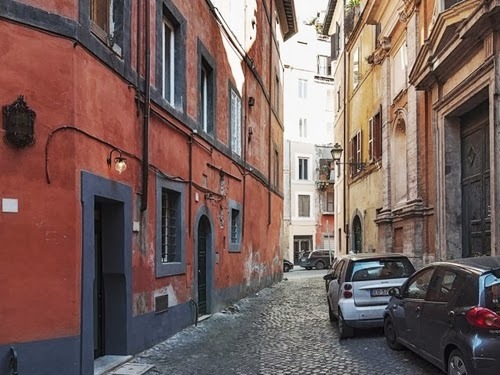 The apartment is right next to St. Peter’s Square. The building is estimated to be about 300 years old. 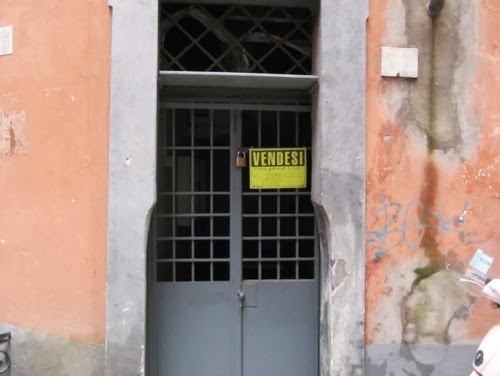 Entrance as it was when Marco Pierazzi bought it in 2010, with the For Sale sign on the door. Front door internal wall, it is thought that the space was converted to a single room residence in the 1930s but not used much between then and 2010. 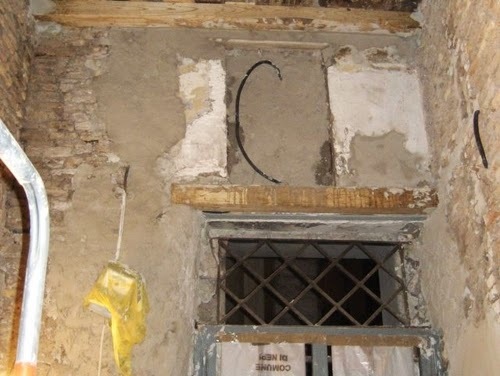 Pierazzi had problems with rot and mould with plaster falling off of the walls. 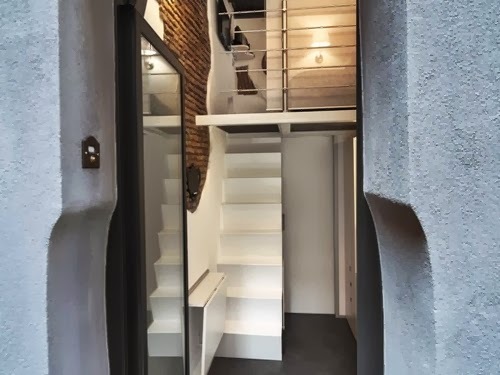 View From Entrance, split level accommodation with kitchen dining and shower room on the bottom and living / Bedroom above. Some of the old brickwork still on show, not covered by the new plaster. Very effective. A close up of the compact design of the ground floor. This view shows the dining area, which is created by raising the panel from the drop-leaf table. Birds eye view of Kitchen and Dining area, with a drop leaf table (the description says that you can seat between 2 and 4 people but more likely 2 to 3). 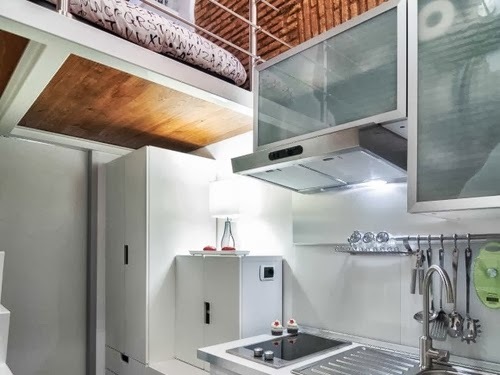 Kitchen with Bed / Living Above. you will need the extractor fan to work really well to avoid the cooking smells to raise to the bed area. I wonder if they retained the window opening above the front door. 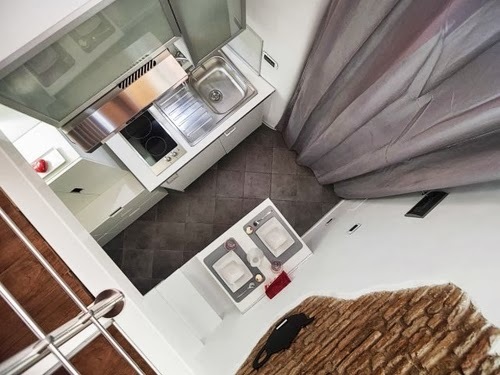 The upper floor doubles as a bedroom and a living space, and so does the double bed, that can be used a sofa, where you can watch some TV or enjoy some music. 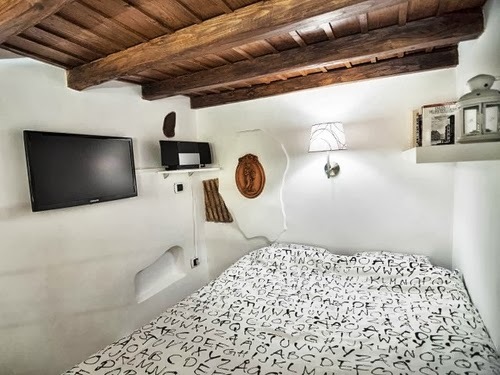 In bedroom mode you don't have much space for anything else, I am guessing all the cupboard space and storage is located under the stairs. 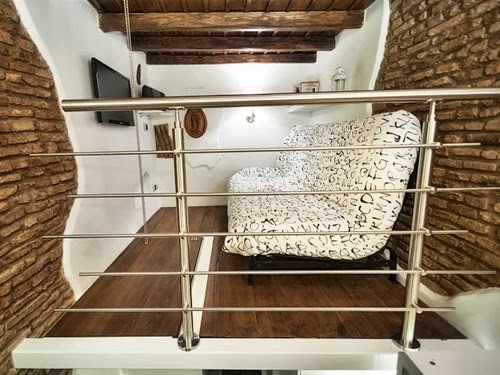 Marco Pierazzi and his wife moved out of the apartment when they were expecting their first child, now they rent to friends and acquaintances. If the alternative is a hotel this beats it hands down. 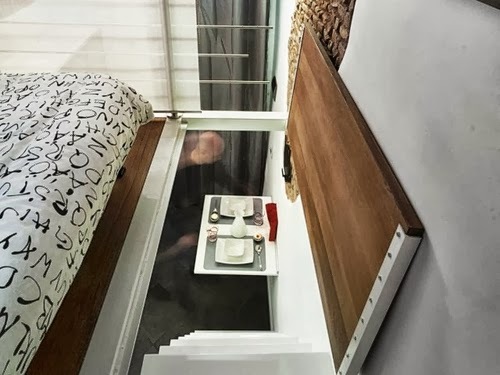 The trapdoor can be opened and closed. This little safety feature makes sure there are no nasty accidents. 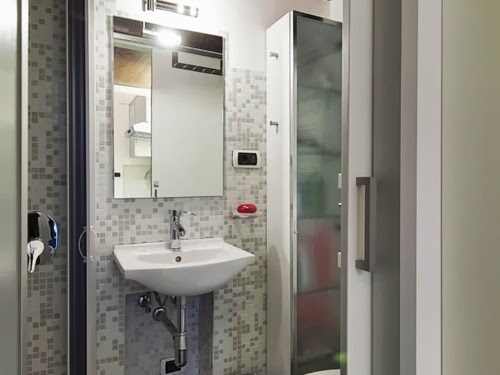 They call it a bathroom, I am guessing that given the space it is a shower room, which looks like it has all you need in it. Finally a lovely and Compact kitchen 2 ring cooker lets face it, you are not going to cook feast in this apartment. 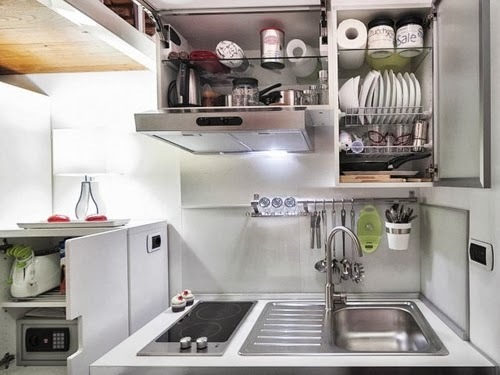 This flat is a lesson in minimalism, where you don't have any more than you absolutely need. This is a Twitter Apartment. What I mean by that is, you have a small place to make a statement, so you have condense it to what is essential to your message.